Horse Tack Review had one of our Canadian testers review this product since Discovery Trekking Outfitters is based in Campbell River, B.C. After several months of use here is what she had to say... Getting a towel in the mail to review might seem like a boring task but I was oddly thrilled. After all, the mountain of snow in central Ontario Canada had melted and gave way to a soupy puddle anyone could envy. Our horses had been transformed into mud creatures living in a bog. Our dogs came into the house and proudly tromped around, leaving an impressive array of dirty paw prints everywhere. To top this off, everyone was shedding their cold weather coats in favour of their sleeker summer digs. The clean freak in me was going insane. The first thing that struck me about the fast-dry towel is how lightweight it felt. The website boasts that my review towel (the medium version / 34�x28�) is best for campers and backpackers where space is at a premium. It suggests that this size would be a thoughtful baby shower gift as it�s suitable for baby�s bath and to be used as a child�s swim towel. This towel is currently available in 16 different colours ranging from pale to vibrant. The colour options alone allow a family to have several of these without getting towels mixed up, and this would also be great for odd cleaning jobs for the same reason. The edges are finished professionally with not a loose thread or stitch to be found. While the care tag provides good instruction on how to clean this towel, there are no instructions to be found on the Discovery Trekking Outfitters Ltd. website, www.discoverytrekking.com. It would be great to see them posted in case the tag instructions are missing or worn, along with a more detailed description of their entire product line. But is this really an effective fast-dry towel? I wasn�t quite sure what to expect with such a lightweight towel, but have managed to become impressed with it over my months of my review period. I first used this towel to dry my own hair after a shower. My hair is waist length and even after wringing it out, there was still too much to bundle up and fit into the towel. For someone with shorter hair, or less hair, this would be a useful product though. It did manage to quickly remove a lot of the excess water and stopped me from blow-drying my hair which is what I normally end up doing. The next test was bathing my horse�s tail. She is blessed with a ground length tail that understandably got covered in mud this past spring. I wanted to clean her up a bit but couldn�t do a full bathing because of the temperatures. I was able to wash her tail and quickly remove a great deal of moisture; enough that when I had brushed her tail through once, it was completely dry. I have mainly used this towel on our animals and can confirm the company�s claim of beach sand not sticking to this product. One quick shake is enough to dislodge any granules and stop them from getting ground in. My little Border Collie absolutely loves to play in water and mud puddles. As any Border Collie owner understands, these dogs are very dedicated to anything that can be perceived as work to them � even if it looks like play to us. She has spent hours trying to corral water droplets from a spilled bucket and bubbles in a mud pit. As you can imagine, this would result in one very dirty dog. She has been bathed or hosed off regularly to minimize the amount of clean-up I have to do in the house. The clean freak in me is starting to calm down a little. This towel is the perfect size to wrap around her and absorb the water she hasn�t shaken off, while keeping her somewhat warm. The biggest test so far would have to have been this towel against three miniature horses on the eve of a show. My neighbor called up frantically asking for help to dry the horses she had just bathed. All were still sporting thick-ish coats from the winter and even after attempting to blow-dry them, some damp patches remained. I wadded up the towel in my hand and rubbed the horses down with it as if using a curry comb. It was able to pull out some of the moisture and allow these fuzzy little girls to fully dry. While this towel easily absorbs dampness, it also attracts hair. Even after shaking it off, the hair was still intertwined. To its credit though, not only does this towel wick away moisture but it also dries quickly. This is probably the main advantage over a regular towel. A few minutes on the line outside and this towel was ready to go again. The care tag specifically states �Do Not Bleach� however when I mistakenly threw it into a wash that had bleach in it, nothing happened. It is still as vibrant and good looking as when I first got it. This is a product which will continue to see use here, though mostly for the animals which it was reviewed with. While seemingly designed for humans, it also makes a great animal towel and one that would be a welcome addition to anyone�s grooming or pet care kit. No amount of horsing around after a month diminished its effectiveness or quality � but we now have fresh, dry animals. My inner clean freak can now breathe. This towel came with no tags or stickers, except the small care tag stitched on. I�m reviewing the medium Ultra Fast-dry Towel from Discovery Trekking Outfitters Ltd. as stated from the enclosed invoice but the care tag says this towel is the �Wick-er Warmup Towel�. 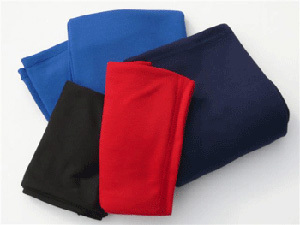 Regular retail price for this size of fast-dry towel is $19.95 Cdn. Visit www.discoverytrekking.com for more information on all of their products!